These Women’s Bright Colored Sequin Corsets are Perfect for Being Noticed at Dragon’s Halloween Ball! Available in Many Sizes. If These Detailed Sequins are Too Bright for You, You Can Find These and Many Other Corsets and Accessories At Dallas Vintage Shop. Dragon’s Halloween Ball is not a Traditional Prty, but Instead it’s an Elaborate Party with Amazing Costumes and Outfits! Like These Women’s Metallic Short Shorts Available in Many Sizes, Perfect for Dancing Surrounded by Music, Art, and People from around the World. Looking for something else? Dallas Vintage Shop is Your Dragon Ball, Music Festival, Rave, Party Headquarters for the DFW Area! 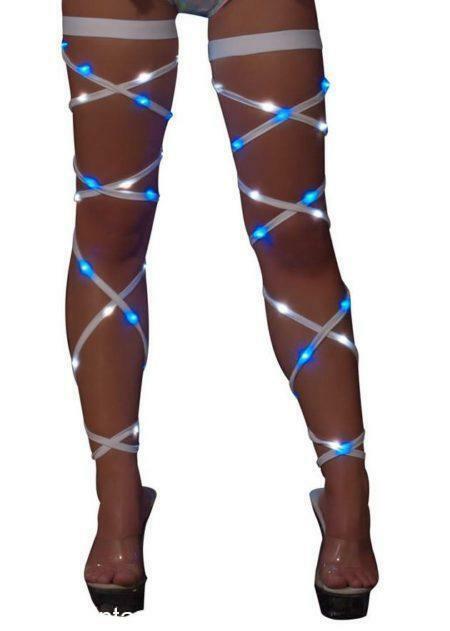 Light up Legs Wraps for Dragons Halloween Ball. No matter what the theme, Rave Wear is always a winner! 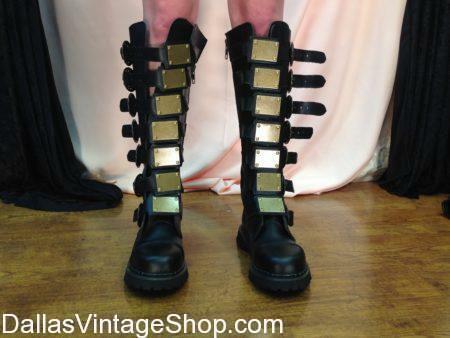 Find all kind of Mens Steampunk Boots to wear to Dragons Halloween Ball! We have Mens Trooper Boots, Mens Quality Combat Boots, Mens Metal Boots, Mens Steampunk Attire & Shoes, Mens Futuristic Costume Trooper Boots, Mens SciFi Costume Boots, Mens Victorian Old West Boots. Find Costume Boots for a Sunken Pirate. We have the Coolest and most Colorful Dragon’s Ball Attire in the DFW Area! 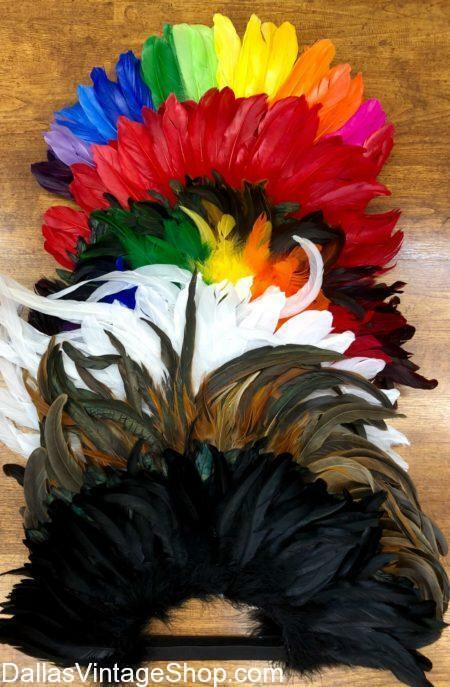 Bright, Colorful Feather Mohawks are extremely popular and we carry several high-quality colors and styles. These are not a cheap, sewn feather like a boa, each one is attached and does not simply come out by shaking. 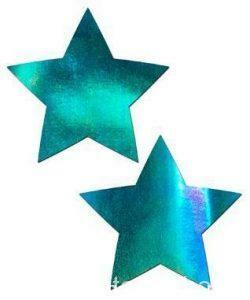 Find all kinds of Dragons Ball Costumes and Ideas at Dallas Vintage Shop! We have many fantastic outfits or headpieces that we customize for you right in our shop. There are giant Feathers, Skulls, Plumes, Mystical, Flowing or Exotic decorative items to add to this or other great headpieces. There is no limit to the costume you can create for yourself when you come in. 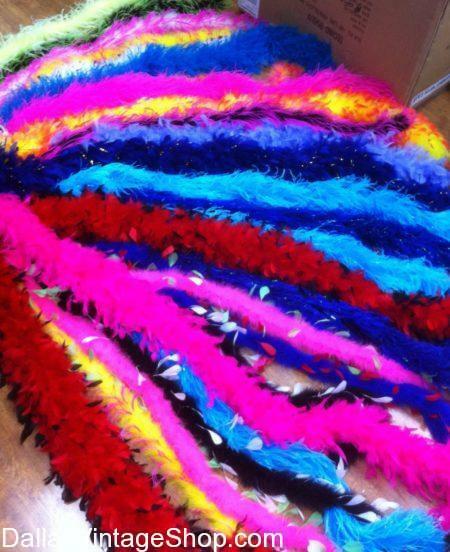 We have Rich Luxurious Fashion Boas in many, many Colors and Styles. Unique Fantasy Costume Ideas, We have Fantasy Boas that are perfect to help you accessorize your Theme for the Dragon’s Halloween Ball. We have tons of Natural Colored Boas along with Boas that are dyed every color of the Rainbow to match any Fantasy Dragons Ball Costume. Our Dragons Ball Masks are sensational and we have Formal Attire, Gloves, Capes, Cloaks, Feathered Wigs, Hats, Headbands & Showgirl Attire in naturals or Bright, Electric colors. You’ll just have to come and spend some time to explore all your options. You are in Dragons Halloween Ball category.